In June President Barack Obama concluded his eulogy at the memorial service for the victims of the shootings in a Charleston, N.C., church by singing the first verse of the beloved hymn “Amazing Grace.” The choir and indeed the entire congregation—and perhaps even the millions watching the service on television—joined the president in singing a hymn that has special meaning for the African-American church. It was a remarkable moment. The hymn is commonly associated with the many other spirituals that emerged from the hundreds of years of slavery in the Americas and elsewhere. It may come as a surprise, therefore, to find out that “Amazing Grace” was composed in 1772 by a former English slave trader, John Newton, who after renouncing his past activity became a major advocate for the end of the African slave trade in England. In what seems like more than coincidence, a musical version of Newton’s life story opened on Broadway on July 16. I saw the production during its preview period, so my observations should be understood as tentative. However, the play has been in development for a year or more, so we can presume that it was close to the final product. The character of John Newton is played by a relative newcomer, Josh Young, who has already established himself as a star playing Judas in the 2011 revival of “Jesus Christ Superstar,” for which he was nominated for a Tony Award, as well as in leading roles at the Stratford Festival and in productions of “South Pacific,” “Evita,” “Les Misérables” and others. At the very beginning of the production, Young startles the audience with an almost operatic rendition of the opening number, “Truly Alive.” Erin Mackey, who plays Newton’s childhood sweetheart, Mary Catlett, has enjoyed an extensive career on Broadway and in regional theater, as well as in film and television. Her lyric soprano certainly matches Young’s voice, and much of the play’s narrative follows her character’s involvement in the abolitionist movement in England. They are joined by the amazing performances of Tony-winner Chuck Cooper as Newton’s slave and close friend, Thomas, and Laiona Michelle as Catlett’s slave, Nanna. They both bring down the house with their passionate solos. Harriet D. Foy reveals her dancing and singing skills as Princess Peyai, the domineering African duchess who sells her own people to the traders. 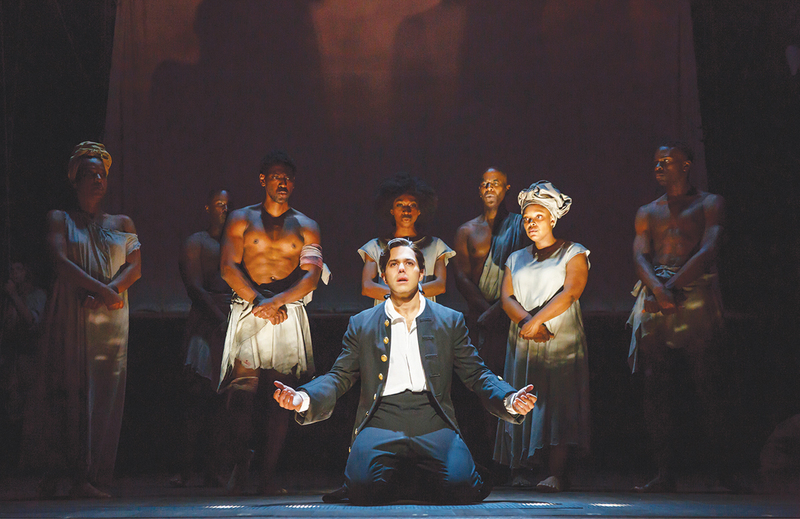 Cooper’s soulful delivery of a song of triumph when he is emancipated is one of the highlights of the play. The 2006 film, also titled “Amazing Grace,” which starred Albert Finney, focused much more on Newton’s post-conversion career as one of the leaders of the abolitionist party in Parliament, as he lived to witness, in the last year of his life, the passage of the law that ended the slave trade in England. The current musical concentrates instead on Newton’s early life, first, at the age of 11, accompanying his father on six voyages, then later signing on with a merchant ship, then being pressed into service in the Royal Navy and eventually transferring to a slave ship bound for West Africa—all before he was 25 years old. His life continued to be filled with difficulties. These years included a flogging of 92 lashes for attempting to desert the navy, which nearly drove him to suicide, and his abandonment by the slave ship’s crew in West Africa, where he himself became a slave to the sadistic Princess Peyai. He survived a shipwreck in which he nearly drowned, and finally he experienced a religious conversion during a severe storm at sea. The play gives the impression that his realization that he “once was lost but now is found” ended his involvement in the slave trade, but he actually continued in the vicious business, as did many devout Christian businessmen, for another six years. In the program notes the authors and the director admit that in their account they “have created some characters and amalgamated some events” in the play’s account of Newton’s life. So it is difficult to tell whether Thomas actually rescued Newton from drowning or whether Catlett was as active in the abolitionist movement as she is portrayed in the play, or even if Newton had such a difficult relationship with his father. Perhaps a reading of Newton’s autobiography, Out of the Depths, would clear up these matters. It seems that the playwrights, Christopher Smith and Arthur Giron, have resorted to some familiar tropes to enhance the story: a young man’s grief over the death of his mother when he was 7 years old, his ongoing struggle with his tyrannical father, the faithful love of his sweetheart that redeems him, his scheming aristocratic rival for Mary’s affections, the servants who function as wisdom figures for the protagonist, the banishing of the villain and so on. While Newton’s story is remarkable, it is the play’s music that disappoints. Almost every number resembles an anthem, with titles such as “We are Determined,” “No Negotiations,” “Never,” “Sing on High,” “Tell Me Why,” “A Chance for Me” and so on. Many a history-based musical has that type of number in the show. “Les Misérables” comes to mind with songs like “Can You Hear the People Sing?” and “One Day More.” But it also includes some tender ballads and even a comic number. So have similar musicals in recent years—“Titanic,” “Ragtime,” “The Scottsboro Boys” and “Assassins” come to mind. But this musical’s score does not have that sort of range. And most of the songs are not very melodic. The program states that this is the “first work of professional writing” by Christopher Smith, who is listed as the “concept creator, composer, lyricist and co-author of the book.” So perhaps it is unfair to compare him to Sondheim or other award-winning composers. Yet one cannot help but wish for better work from this newcomer. When the entire cast joins in singing the title song, one is reminded of the beauty and power of a simple melody and a poetic lyric. It is a powerful way to end the show, and when at curtain call the cast invites the audience to join in singing the hymn, it is an invitation impossible to refuse. Would that the rest of the score could measure up to that standard. I am surprised that a Jesuit would praise the Augustinian-Protestant notion of salvation by grace. This was sunk by the church in the 18th century for good at the instigation of the Jesuits who felt it undermined missionary work. Read Leszek Kolakowski's book GOD OWES US NOTHING. Just saw this today. I loved it! One small correction: the 2006 movie "Amazing Grace" is really about the career of William Wilberforce - a native of my home town of Hull - who led the abolitionist movement in parliament. Albert Finney plays John Newton, who in the movie is living a penitential life as a church cleaner; a minor but influential role. This article also appeared in print, under the headline "How Sweet the Sound," in the August 3-10, 2015 issue. Michael V. Tueth, S.J., is emeritus professor of communication and media studies at Fordham University in New York.